Most people love chocolate. I really, really love chocolate. I confess I’ve had this gorgeous book for over a year. I was planning on testing the heck out of it, and then my health stuff started happening and I didn’t get to it. And now chocolate is off limits because of the migraine diet. However, I can still appreciate how gorgeous and luscious this book is, and one of you will love winning it! 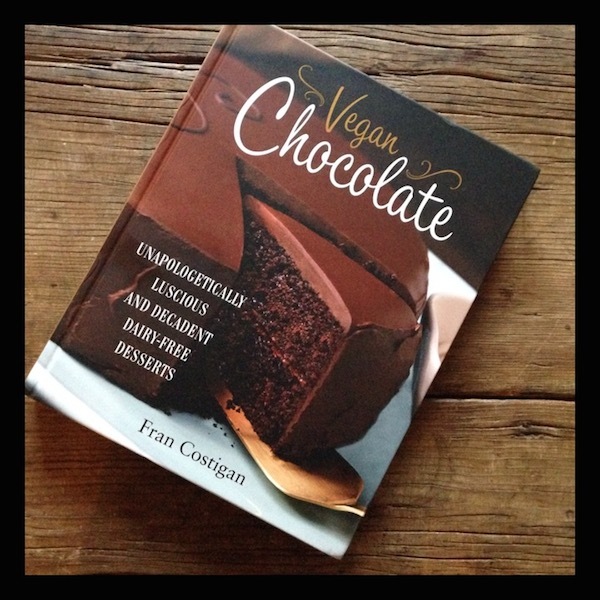 The book is Vegan Chocolate: Unapologetically Luscious and Decadent Dairy-Free Desserts by Fran Costigan. I’ll be giving away this book in my monthly giveaway on November 28th. This month the giveaway will run for a week because of the Thanksgiving holiday. It’s a beautiful, rich hardcover book, with the lettering like shiny icing on the cover. Inside, the Introduction covers Costigan’s memories of chocolate and desserts, her first job as a pastry chef, and the health problems that led her to adopt a vegan (plant-based) diet. 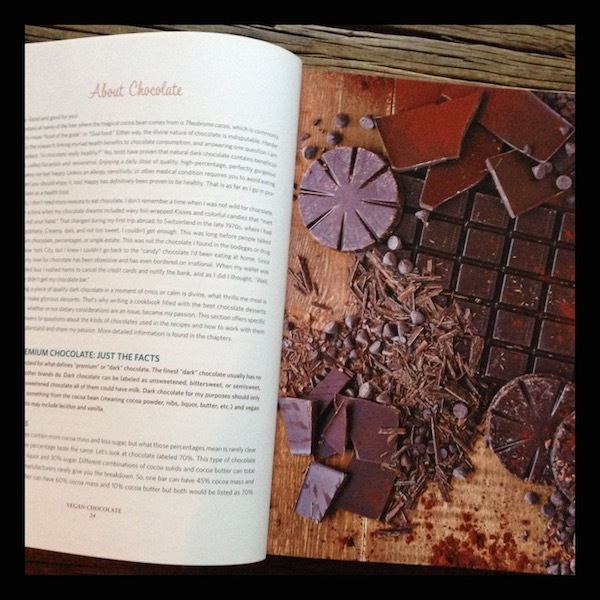 Chapters include: Ingredients sweeteners chocolates and equipment, Truffles, Cakes, Showstoppers, Cookies bars and little bites, Pies and tarts, Creams puddings and gels, Frozen desserts, Confections, Beverages, and Master recipes. Included in the back matter is a resource list, bibliography, and organizations, websites, and publications that might be useful. The photography by Kate Lewis is stunning. Full-color images are featured on every two to three pages. Most are full-size. Here’s what I would have made in my pre-restriction days: lemon olive-oil truffles, chocolate orange and olive-oil cake, eclairs, gluten-free brownie bites, raspberry chocolate silk tart, warm chocolate cashew cream pudding, chocolate Mexican-spiced ice cream, no-mallow rice crispie treats, chocolate horchata, and chocolate ice cream shell. Most of the 120 recipes are not gluten-free. It’s beautiful, like a trip to a very high-end chocolate store. 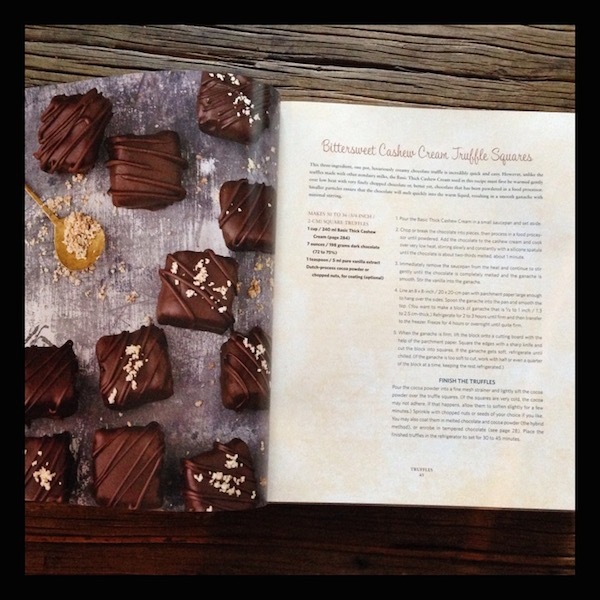 Costigan shares her extensive knowledge of working with the ingredients throughout the book. Recipes were not coded for gluten-free, soy-free, or nut-free diets; nutritional analysis is not provided, which would be helpful for low-sodium eaters. 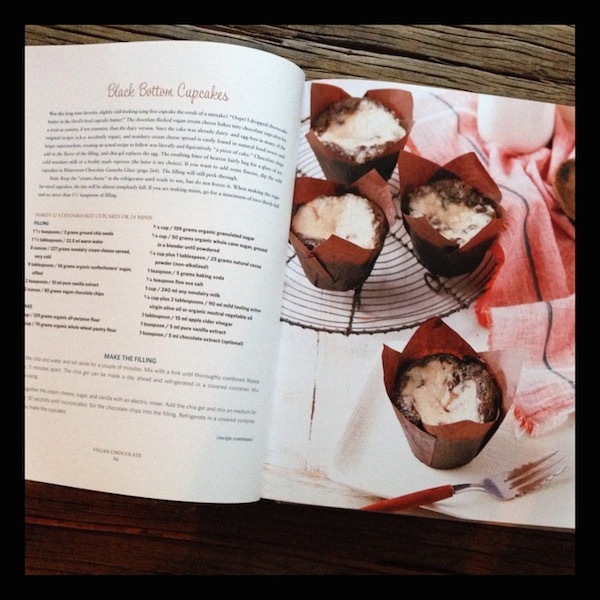 The book uses organic granulated sugar extensively. Required FTC disclosure: I received one copy of this book from the publisher for the giveaway on November 28th. I read that sage tea is very good for headaches. 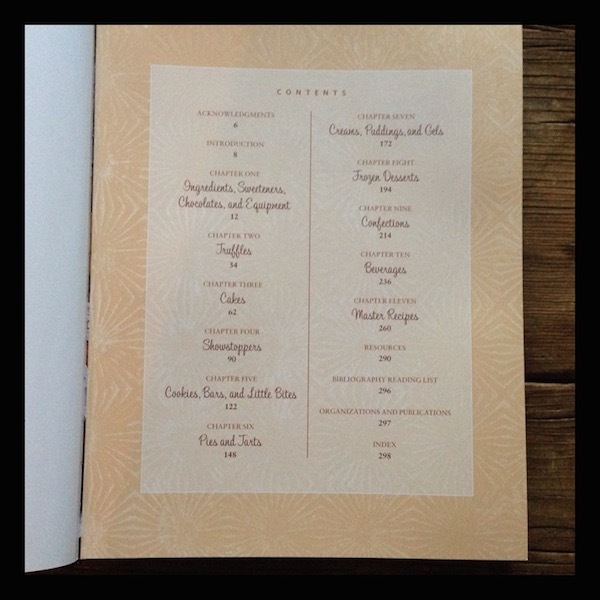 What a gorgeous cookbook! Lots of gift giving potential (both the book itself and the goodies within). Thanks for the review! This does look like a beautiful book – those pictures alone would make me want to leave it out on display. And chocolate makes me happy. I would definitely consider a recipe or two to test out before buying – I wish all cookbooks did that – shared them – maybe some do … I need to look! Andrea, if you search around for other reviews, there may be recipes that have been shared from this book. Or check her website, http://www.francostigan.com. Recipes there should give you an idea of what they’re like. Yes, it’s a dreamy coffee table book for sure!